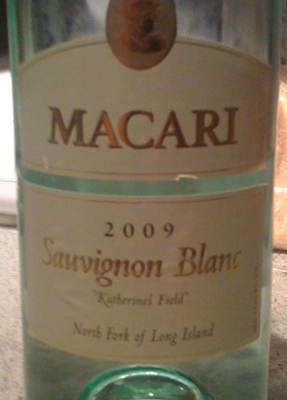 Overall the flavor and aroma profile was very nice, but I felt it could have used more acidity. For 15 bones it is a solid effort and paired great with our stir fry with peanut sauce. Interesting note, this is Wairau River’s first CarboNZero wine. CarboNZero is a government backed program to help individuals, institutions and events manage, measure and mitigate their greenhouse gas emissions. 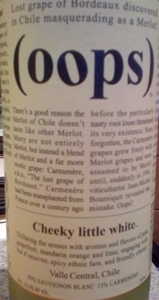 Pretty cool – a nice added bonus to enjoying your wine. With this unseasonably warm weather hitting the Richmond area, it was time to break out a crisp Sauvignon Blanc, from Virginia. We broke out the 2006 Chester Gap Cellars Sauvignon Blanc to compliment our Indian food as well as the warm weather. 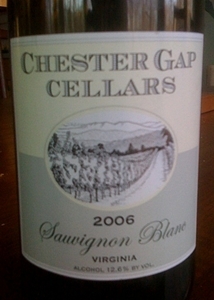 Sauvignon Blanc would not be considered one of Virginia’s best known grapes but certain wineries including Chester Gap have the proper growing conditions to do well with the varietal. Chester Gap’s combination of high elevation, eastern exposure and rocky soil structure lay the foundation for a crisp mineral driven Sauvignon Blanc. Although I had tasted this wine at the winery last summer, it still surprises me that a Loire style Sauvignon blanc can be produced here in Virginia. At $15 it isn’t a bad price either, especially for the quality it delivers. It was great with the Indian food, but would go great with shell fish dishes as well. Head up to Chester Gap and visit Bernd, and pick up a bottle.